What a great Holiday Season! I hope everyone enjoyed good times with family and friends! I had an interesting time this year when a relative tried to start the traditional holiday fire after dinner. Have you ever seen more smoke coming inside the room than going up the flue when somebody is trying to start a wood burning fire? Although it was entertaining at first, it can quickly ruin the mood, and scare the little ones into tears. If you’re lucky, you have a 10-year-old niece panicking and calling 911 on her iPhone to let the authorities know that her uncle is starting the house on fire. It was quite the scene, and after clearing out all the smoke (but not the smell), we continued the evening. Fireplaces are popular and can add value to a home. 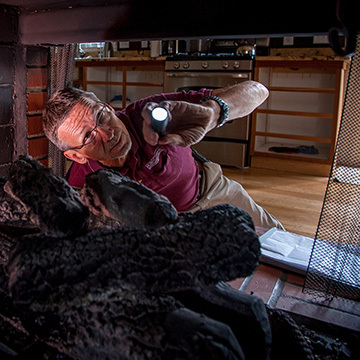 But, without a clean and properly vented chimney, the potential for fire and smoke damage inside your home is higher – leading to devastating results. Whenever you burn a fire, there are byproducts of combustion that are created. These by-products include smoke, water vapor, gases, unburned wood particles, hydrocarbon, tar fog and assorted minerals. As these substances exit the fireplace or wood stove they flow up into the relatively cooler chimney, and condensation occurs. The resulting black or brown residue that sticks to the inner walls of the chimney is called creosote. It can be crusty and flaky, tar-like, drippy and stick, or shiny and hardened, but always combustible. If it builds up in sufficient quantities – and the internal flue temperature is high enough – the result can be a chimney fire. Chimney fires can cause serious damage to structures, destroy homes and injure or kill people. Most chimney sweep professionals consider 1/8” thickness of creosote buildup enough to require cleaning. Another common problem for wood burning flues is intrusion by animals. Birds and small animals think your chimney looks like a hollow tree in which to move in. Sweeps often find chimneys packed full of leaves, twigs and baby animals, such as squirrels and raccoons. The solution of course is a good cleaning and a chimney cap. It is also a good idea to install a type of thick screening material around the flue cap to maintain positive air flow while preventing unwanted visitors. Fireplaces are a great addition to any home. There is nothing quite like a warm, cozy fire on cold nights. Just like other components of a house, periodic inspection and a little maintenance goes a long way in preserving and protecting your home and family. NOTE: This website and the material covered is for informational purposes only. We recommend you consult with a trained, accredited repairperson before taking on any project. Home Standards Inspection Services cannot be held responsible for any property or medical damages caused by work you do pertaining to items you read about or videos you watch on our website, through our social media channels, or in print materials.